I haven't yet found a product that lives up to the Anastasia kit. Most cream contours have that horrible orange undertone that just won't work on fair skin. 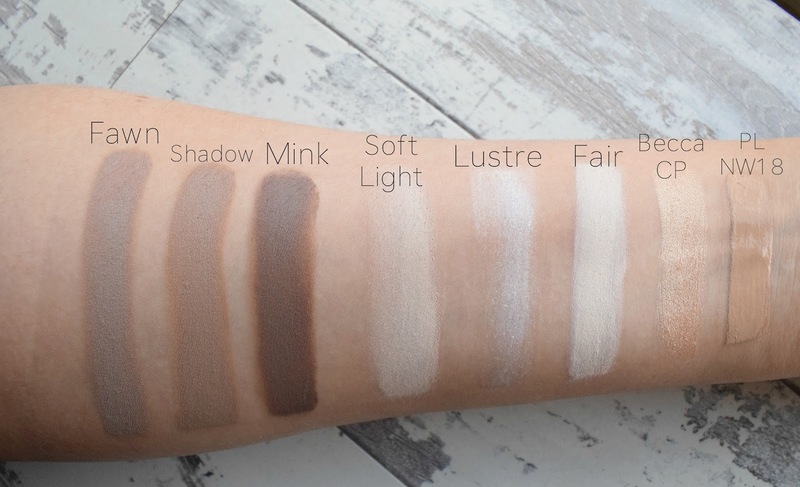 This kit delivers that much needed grey undertone (Fawn) and also includes a significantly darker shade (Mink) which is perfect for when I fake tan. The price can put some people off, but the amount you need to use is minimal as this product is extremely pigmented and if you mix a good facial oil in with the product, it helps it blend a lot easier. It also combats the dreaded concealer highlighting as these creams are so much lighter than using a thick gloopy concealer all over your face. This is a cult favourite of mine right now and I pretty much use it everyday. I waited a long time to buy it after the initial release that sent everyone crazy. I’d read that it was actually going to be a permanent product and instead of paying £60 on eBay, I waited to see if that was true… and my patience paid off, I got this for £30! It's now a permanent fixture in the Becca range and it's the perfect colour for everyone and sits so beautifully on the skin. I do definitely recommend this if you love a powder highlight/strobe. It's very pigmented and I'm struggling to hit pan on it despite wearing it everyday! I have a love affair with Mac for bases and this is my newest fave. I love the fact that it hasn't got that dryness that Studio Fix has which makes it a really good foundation if you want to blending a lot of product over the top of it. It's downfall is that it only comes in NC15 and above so if you're ultra pale like me without fake tan, it can be slightly off-putting to purchase. or if you have any drugstore recommendations! I have extremely pale skin and the Anastasia Cream Contour Kit looks right up my street and perfect for my ghostly complexion - think I'll be adding this to my wish list! I'm adding to my wish list the Becca x Jaclyn Hill Shimmering Skin Perfector in Champagne Pop! The Anastasia kit looks great for fair skins, it's so tricky getting drugstore contours without being too dark/orange.